An outdoor sauna needs due care for long-term, trouble-free service. It includes a set of measures aimed at keeping surfaces free from contamination and subsequent disinfection for as long as possible to maintain hygiene, as well as to ensure competent operation as per the technical parameters and safety requirements. The easiest way to care for the outdoor sauna is wet cleaning with a brush and water. The last person, leaving the outdoor sauna, should quickly rub the shelves, walls, etc. with a wet brush. This 30-second practice will keep the outdoor sauna in good condition and won’t require any stronger cleaning agents for wooden parts other than water. After all, the harsh environment and contamination will always remain and will accumulate over time and decompose the outdoor sauna. For complete removal of fat and contamination, one should also carry out regular cleaning with soft brushes and degreasing agents. Besides, it is necessary to wash all surfaces with neutral soap once every 2 weeks for neutralization. To make the benches look like brand new, you can lightly polish them once in a year. This will return them almost a new kind of. After you’ve done steaming, do not forget to open the sauna door to ventilate all the vapor. The heat that was left in the stones and the wood will dry the outdoor sauna. If you forget about such procedures, an unpleasant smell will quickly remind you of the negligence that you made. However, the first warm-up removes remnants of protective substances and lubrication fluids that fell on the wood burning stove at different stages of its manufacture. They can cause unpleasant odor and even smoke. 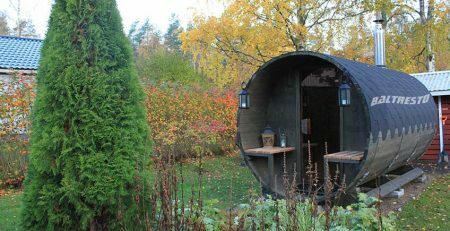 Therefore, at the very beginning of the first furnace light-up, it is necessary to provide good ventilation for the outdoor sauna space. Due to the inconvenience caused by the smell, we do not recommended to use the sauna during the first warm-up. 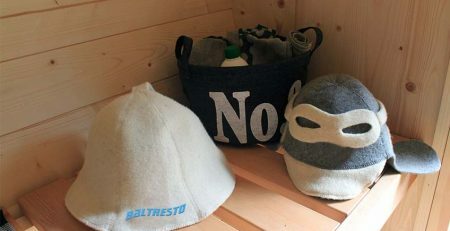 When cleaning the outdoor sauna, it is necessary to remember and be careful that the wood does not get wet because wetness can rupture the wood fabrics. Therefore, the wooden covering of the outdoor sauna, and the benches as well, in any case, cannot be watered with water from a hose or be cleaned with water pressure apparatus. Also, this applies to the floor inside the cabin too. Also you shouldn’t wash the outer covering with a hose or water pressure apparatus. Otherwise, there might be risk of rupturing the wood fabrics. The wooden material of the outdoor sauna room, among other things, darkens over time. The sunlight and heat of the wood burning stove contribute to the darkening. If you install the wood burning stove as per the manufacturer’s instructions, the wood burning stove will not heat the combustible materials in the sauna room to a dangerous temperature. The surface of the wall and ceiling of the sauna room is allowed a maximum temperature of 140°C. The small stone fragments that come off from the stones of the wood burning stove and rise upwards with the airflow can also cause the wall surface to darken near the wood burning stove. 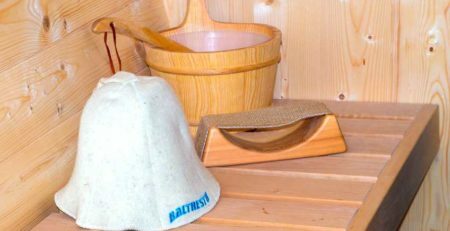 Clean outdoor sauna largely depends on the use of a whisk and sheets. Drops from a birch whisk leave brown spots and a greasy one from sweat. So, if you use a whisk and love to steam, but do not want to polish it regularly, then the walls should be covered with protective layer, and the benches should be soaked well. Impregnation does not allow contamination to enter the wood and, as a result, enable washing them with ease. For walls, there is a special water-soluble composition. It is almost invisible on the wood and does not darken or cause any black spots over time. After coating with the composition, the wood gets a light, elegant shade. Its surface becomes smooth and pleasant to the touch, slightly glossy, and well-polished, like expensive wooden furniture. Also, if you like to lie in the outdoor sauna, you can additionally cover the benches with sheets. 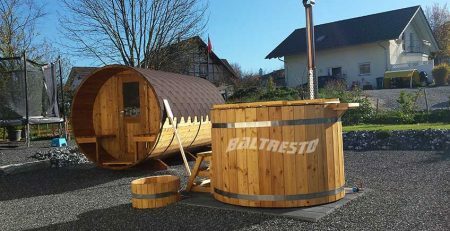 Why do you need disinfection and wood treatment in the outdoor sauna? 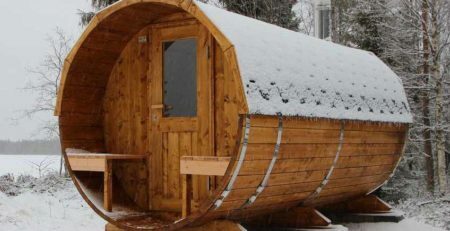 There are particular means of treatment of the benches, walls, and ceiling in the outdoor sauna. The climate in the steam room promotes the reproduction of microbes, bacteria, and fungi. Microbiologists have proved that mold and fungus can cause the following diseases: increased fatigue, general malaise, headache, migraine, nausea, dizziness, bronchitis, bronchial asthma, rhinitis, allergic rhinitis (hay fever), rheumatism of the limbs, dermatosis, pulmonary diseases of the respiratory tract, cirrhosis of the liver, and much more. Many molds are powerful allergens and immunosuppressants. Allergy from mold fungi can cause an unpleasant disease like a migraine, the cause of which sometimes cannot be found. Therefore, visitors should be particularly careful about disinfecting the sauna.